When it’s hot outside, and I mean really hot, then two things are nearly certain: It’s probably August, and tomatoes and zucchini are abundant. But to me, ratatouille is a cold-weather food. That’s why I use canned, diced tomatoes in mine. I firmly believe that there is nothing better than a piping-hot bowl of ratatouille over white rice with a side of roast chicken to make me feel cozy on a cold winter’s night. In my opinion, there is nothing more reminiscent of my year spent in France than this Provençal dish, and I love it so much that I have been known to cook up enormous batches and freeze them as a surprising side at Thanksgiving. 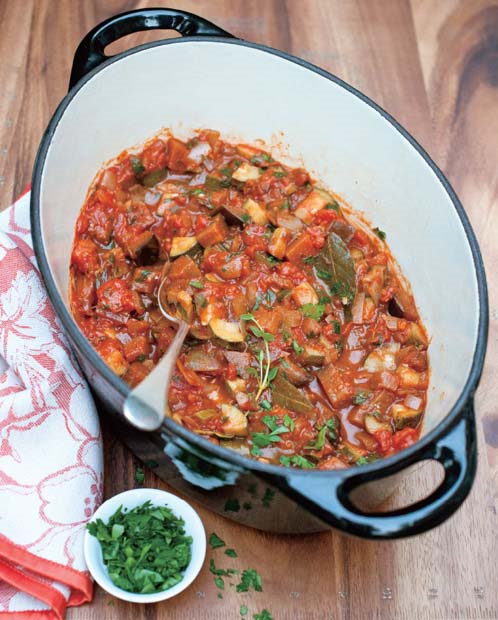 Honestly, there’s nothing like a bowl of ratatouille, and there’s nothing like planning ahead! 1. Heat the oil in a medium-size pot over medium-high heat. Add the garlic and onion and cook until they are soft, about 5–7 minutes. Add the red wine and let it cook off for about 30 seconds. Reduce the heat to medium, add the zucchini and eggplant, and sauté, stirring often, until they begin to soften, about 10–12 minutes. Add the tomatoes and their juice, thyme, bay leaf, fines herbes or herbes de Provence, salt, and sugar. 2. Simmer the ratatouille, covered, on low heat for 20 minutes, remove the lid, and continue simmering for an additional 10–12 minutes. The vegetables should be soft, and the sauce should have begun to thicken. Remove the thyme and the bay leaf, fold in the chopped parsley, and serve immediately. 3. Store leftovers refrigerated in an airtight container for up to three days. The completely cooled ratatouille may also be frozen in airtight containers for up to three months.